Did you know that the Washington City Paper recently named the 15th Street Bike Lane (or “cycletrack,” as the City Paper said), the “Best Bike Lane of 2011?” I did not even knew this was a “Best of” category. 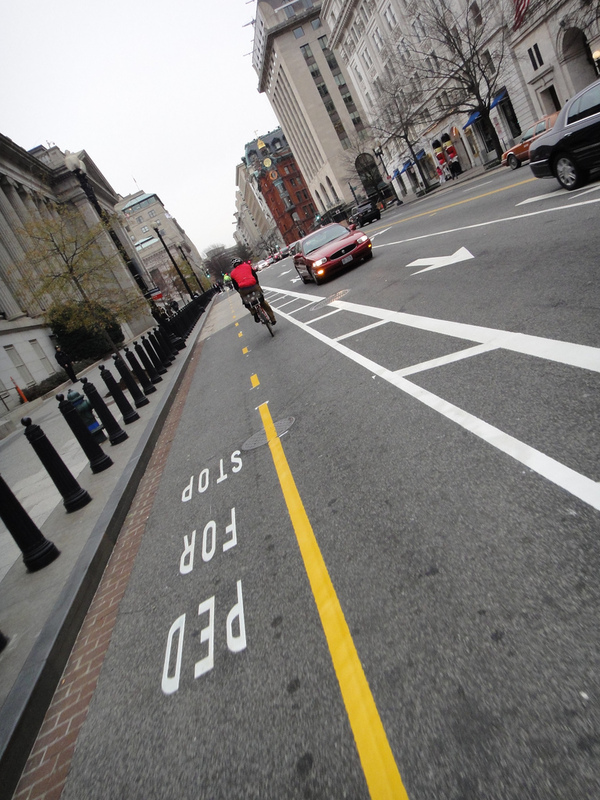 For those who may not have ridden it yet, the 15th Street Bike Lane is a two-lane bikeway that begins (from south to north) at Pennsylvania Avenue and 15th (of course! ), takes the rider up to New York Avenue, through the White House Plaza, reconnects with 15th Street, and then continues north to Euclid Avenue. Having ridden the 15th Street Bike Lane since it first came to be in December 2010, I have appreciated its existence, but note that it works better for me in some parts than others. The section north of the White House Plaza. 1. I think the bike lane segment that runs from Pennsylvania to New York Avenue (White House Plaza) is a big improvement in my commute experience, compared to taking the street. As cyclists, we are now all routed along the west side of 15th street, which minimizes our exposure to vehicular traffic. Because the west side of 15th street is flanked by the ellipse and the White House, no traffic passes in front of us and no one can make a left turn across the bike lane (except for the minimal official traffic that comes and goes). We just have to mind the signals and be on the lookout for pedestrians. Previously I took the street on this section and had to deal with fast-moving traffic, cars making left turns, and cars that wanted to quickly rush around me and then make a right turn right in front of me. That problem is now gone. The only frustration I occasionally experience on this segment is that sometimes vehicles park in and block the bike lane. This doesn’t leave us with much recourse except to take the street into incoming traffic (not recommended) or walk the bike up onto the sidewalk. This was more of an issue when the lanes were initially added. Overall, this segment is a positive change for cyclists and people have been pretty good about not parking in the lane. 2. The 15th Street Bike Lane segment that runs north of the White House Plaza has proven problematic for me as a northbound cyclist (particularly K Street up). There is so much more that I have to be wary about when I’m on the left side of a busy four-lane road. Cyclists have to be extremely mindful about people coming out of parking garages on the cyclists’ left. These drivers are often looking past the bike lane to the road to see what the cars are doing. I also have to watch out for the possible left turns of northbound cars. These left turners are hard to see when I am more than two lanes away on the other side of the street going the same direction. I don’t have eyes in the back of my head. I like the concept of contraflow and keeping cyclists all in one general area of the road. However, it actually seems safer to me to stay out of the designated bike lane on this segment and ride on 15th Street as a car would, especially since I eventually make a right turn off this stretch. This right turn out of the bike lane forces me to cross back over 15th Street. That is not a big deal, but it simplifies things to just ride on the right side of the road. However, the down side of taking the street on this segment is that, while I may feel safer, I am loathe to court any “Get in the bike lane!” comments. What’s a person to do? I think the 15th Street Bike Lane is a great solution if you are a southbound moving cyclist, but going north from K Street on it does not feel safe. However, I like that people in D.C. are working seriously to make this a bicycle-friendly city. I continue to be baffled by all the car traffic. Have you ridden these lanes, and if so, what has your experience been? While I like cycle tracks because they encourage the timid to give urban riding a go, I prefer mixing in with the cars. Having cut my urban biking teeth on the streets of Boston and Cambridge am used to riding in traffic and actually find it energizing. Of course, most of my friends think I’m a few spokes short of a wheel….. I actually like it. I do not like when dumb-dumb drivers park in the in the lane while I’m going northbound, but luckily that has been the exception for me, rather than the rule. The only thing I don’t like is that they still haven’t extended it up to Euclid. Riding down (SB) 16th St. during rush hour is…..an experience. A death-defying experience. And I suppose I *could* simply ride down the “wrong way” on 15th to get onto the cycletrack from Euclid….but my goody-too-shoes inner child shuns that option. The other thing I don’t like about the cycle tracks is that they encourage cyclists to disregard every lawful & common sense rule they’ve been taught about riding in traffic. I rode with a bunch of coworkers the other week (i.e. bicycle cops, mind you) and it was *painful*. Half of them didn’t even realize that the cycletrack was two-way now, and 90% of them couldn’t understand the concept of following the pedestrian signals (rather than the vehicle signals). It was an embarrassing mess. I say embarrassing because I actually like taking the cycletrack downtown. But they obviously had no idea how to use the damn thing! I actually had one lady scream out of her car at us because they didn’t pay attention to the “left turn only” on the Penn Ave lanes, and she almost hit them….and I couldn’t blame her one one bit (except for her choice of language…I’m sorry, but you have no idea what the heritage of my coworkers is..). One thing is for certain, traffic laws need to be reevaluated. I agree with your impressions. As we were taught as kids, and as I tell my kids, you never ride your bike on the left side of the road. So it’s a mindshift to ride northbound in the cycletracks, both for the cyclist and for motorists who aren’t accustomed to having cyclists there. I would prefer separate bike lanes or at least sharrows. The second issue is that, just about everyday, I see tour buses, taxis, delivery trucks, etc. obstructing the cycletrack. Pedestrians wait to cross the street in the cycletrack rather than on the sidewalk. Everytime I ride in the cycletrack, I end up asking myself – why am I punishing myself for being a cyclist? Things go much smoother in the regular traffic lane. I will ignore the “Get in the bike lane” comments the same way I ignore the stupid honking by impatient drivers. On a different topic, your new banner looks awesome! Great picture. I also preferred the original set up of the 15th St Bike lane: the sharrows in the right lane of traffic and a Southbound bike lane. However, most cyclists road Northbound in the bike lane anyways. 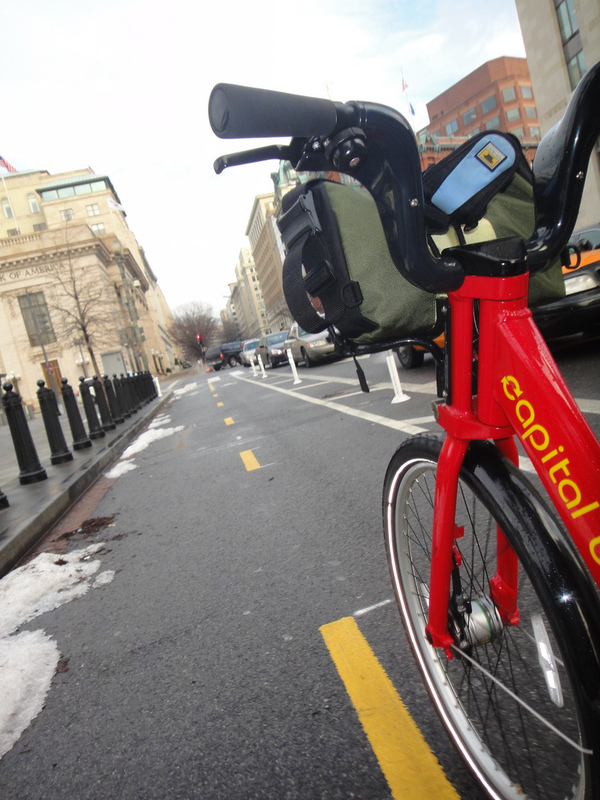 – Extending it to Euclid (or farther North) to connect the bike lane to Columbia Heights and Mt. P.
Side note: does anyone know what’s up with the missing pavement on 16th St between Harvard and Euclid? I emailed DDOT about it, but I didn’t get a response. Thanks, all, for your thoughtful comments. I also have had problems with the timing of the lights going northbound. Lots of stop and go. It’s better just riding in the road. I agree w/ Kate that it seems counter to common sense to follow the pedestrian signals. Like freewheel notes, it is a total mindshift to be riding on the left side of the street. And I have had issues with people parking or pedestrians standing in the bike lane while they wait for the light to change. I had not had any issues of late, but of course after writing this post, I now find myself dodging out of the lane because a vehicle parked there. Charles, I do not know what is going on with the missing pavement. Oh, and thanks, freewheel for the comment on the new banner. I love that photo so appreciate the props! I tried it once north of the White House. Particularly on the recumbent, I think it is more trouble than it’s worth and have stuck with the through lanes since. I strictly prefer the SHARROWs or standard bike lanes.